Over the weekend my friend Michelle and I had our monthly craft night, so today I wanted to share the last 3 projects we completed. If you want to see any of our past projects, I put together a list at the bottom of the post. 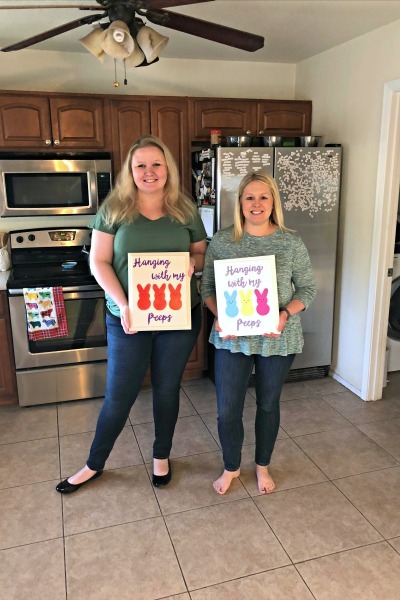 We’ve made so many fun crafts since we started and I think we both still really love our monthly tradition. It’s also fun that Adam is friends with her husband, so they can go hang out while we craft and then we all meet up for dinner later. Anyway, for our November craft we made winter-themed pillow covers. The fall pillow covers that we made a few months before turned out so cute that we decided to create them for each season. 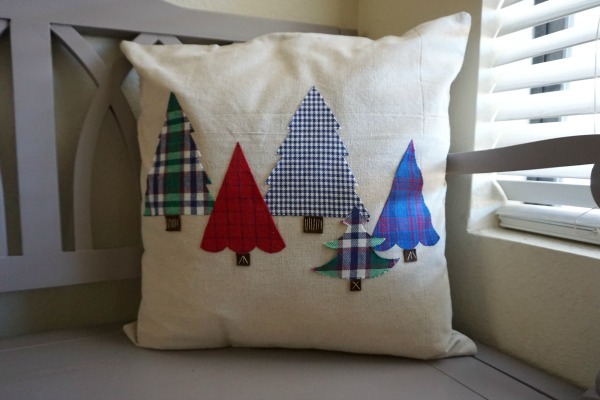 I wanted to be able to use mine after Christmas so I cut out flannel trees using the directions and templates from this tutorial from On Sutton Place. Michelle wanted to make hers for Christmas, so she cut out stockings and hand-stitched them on. 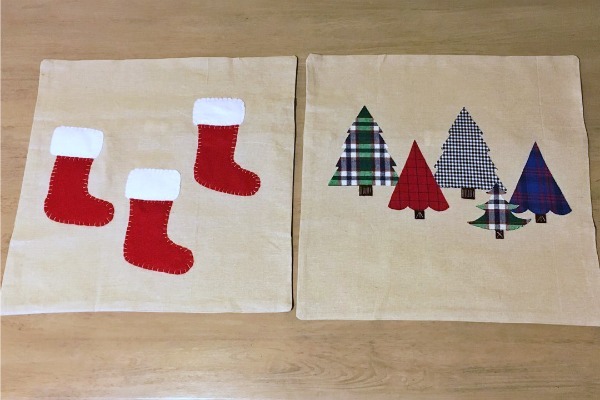 She just used a stocking template that we googled and printed out. This stocking pillow knockoff from 320 Sycamore was her original inspiration. In December we decided to just make fudge instead of crafting, so our next craft night wasn’t until for another month. In January we made holiday letter blocks. I bought a 4x4 from Home Depot and had it cut into square blocks. 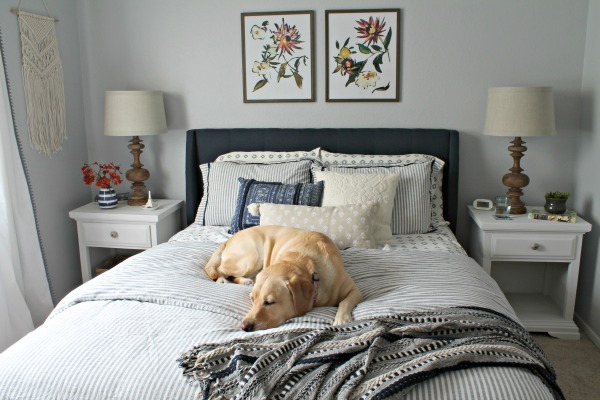 We pinned a lot of different ideas for this project, but this one and this one ended up being our main inspiration. For my blocks I painted everything, so I only finished 2 sides during our craft night (LOVE and HOP with a bunny). I ended up finishing another side the next day, so I now have LUCK too. 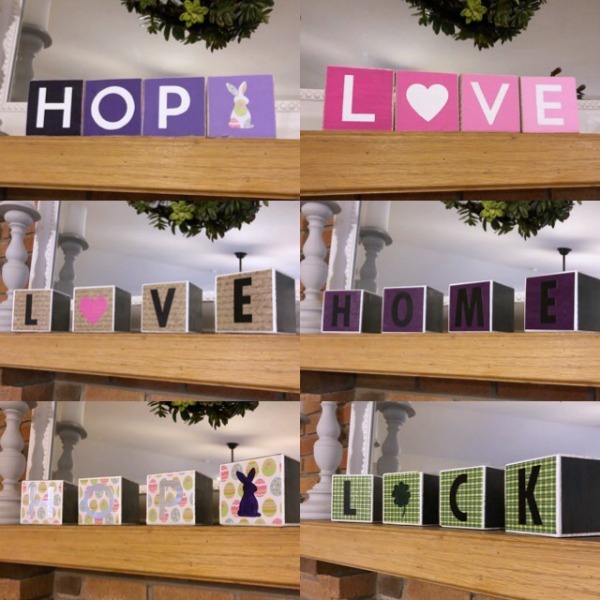 Michelle used craft paper to decoupage her blocks, so she ended up with LOVE, LUCK, HOP with a bunny, and HOME. Unfortunately, she put her blocks above her TV and it got too hot. The Mod Podge melted a bit and ruined one of the sides, so she’s going to just leave it as LOVE. Isnt’ that crazy?!? I had no idea it would do that. We missed February because of scheduling conflicts, so we’re finally onto our most recent project. 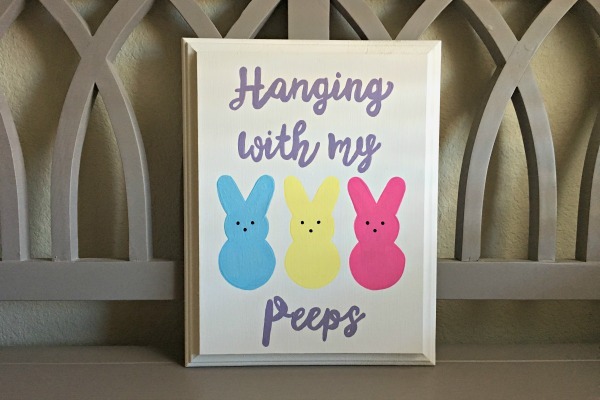 For our March craft we made “Hanging With My Peeps” signs for Easter. This pin was our inspiration and we used this template for our Peeps. I think it would be safe to say that we both like our signs, but we don’t love them. I love how my Peeps turned out, but I don’t love the lettering. We’ve been trying a bunch of ways to do lettering on signs and for this sign we used the tracing method. Basically you print out your design and then trace it into your wood with a pencil so it leaves and indent and you just fill in the indent with paint. I just can’t get a clean line that way! I think vinyl is the only way I’ll do lettering going forward. Regardless, it was a fun day and we’ve wanted to make these signs for a long time. I think our next craft is going to be spring pillow covers. After that we have some ideas, but if you have any suggestions, let me know! Absolutely love the pillows and trees. Looks like you two are having a blast. The Peeps signs look great - I thought the lettering looked wonderful. That's so lovely that you and your friend have monthly craft nights. You've come up with some lovely creations! It's such a fun way to spend an afternoon and we've made so many fun craft so far! 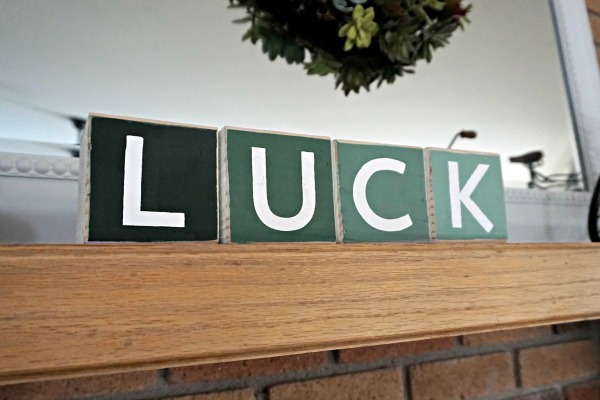 Oh my gosh, I love the idea of those blocks for different holidays - so cute!! I also love the "peeps" craft. What a fun tradition! Thanks Meg! I still have 1 blank side left on my blocks, so I think I'm gong to do BOO with a ghost for Halloween! I would LOVE to try making a pillow. I always pin fun and exciting new crafts to try, and somehow never get to it. 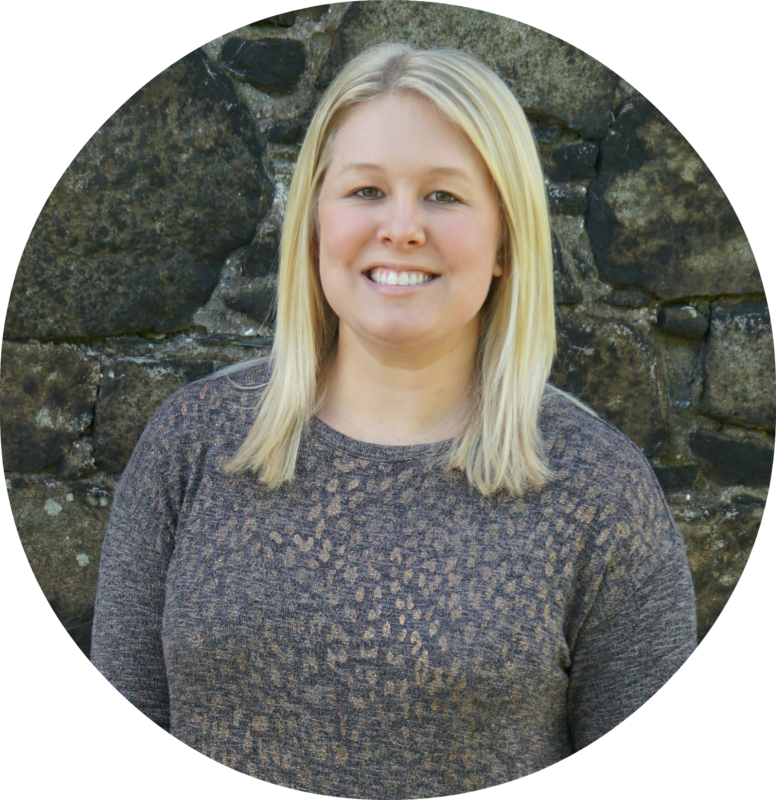 My goal for the summer is to allow my creativity to lead and take over, especially because I will be making things for my classroom. Thanks for the inspiration! Yes! That's exactly why we started doing a monthly craft night. We were tired of just pinning, but never actually making anything! OMG that PEEPS decor is adorable and perfect for Easter! And I love those throw pillows. I wish I was crafty like that! Thanks Marcie! I don't really get into holiday decorating (except for Christmas of course), so it's fun to have a few pieces to pull out for Easter and other smaller holidays! I love your Peeps! I love all your crafts but I think the lettering looks awesome. When I attempt Pinterest crafts they end up looking like a 5 year old made them, lol! LOL! I've had a few Pinterest fails too! SO cute! How fun! LOVE those hanging with my peeps pictures!